The countdown has begun for the world-famous Piccadilly Lights to be switched back on, after over nine months in darkness for major renovation work. To mark the moment, Landsec, the UK’s largest listed commercial property company and owner of Piccadilly Lights, is launching the #PiccadillyOn campaign, bringing colour to life in aid of Barnardo’s. 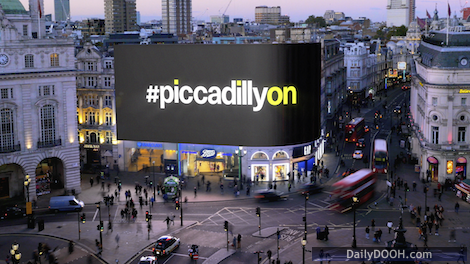 The #PiccadillyOn campaign invites people around the world to be part of this remarkable moment in London’s history. For a minimum donation of GBP 2.00, people can sponsor a unique colour chip which will form part of a 3D countdown clock on the screen, before forming part of a choreographed reveal moment in October! By visiting www.PiccadillyOn.London you can choose your colour to support Barnardo’s and be part of this historic moment. You’ll receive a unique digital colour chip to post on their social media channels. All money raised will go to Barnardo’s, the UK’s largest children’s charity and Landsec’s national charity partner for 2017. Coca-Cola, which has long been part of Piccadilly Lights’ history, has kicked off the fundraising with a donation to sponsor their red colour chip. The Piccadilly Lights site has been under renovation since January. The original patchwork of screens is being replaced with a single state-of-the-art Daktronics LED which will be able to divide into six full and subtle motion segments. Advertisers will be able to stream live videos, lifestyle updates, such as weather and sports results, and real time social media feeds. Ocean Outdoor CEO Tim Bleakley told us “Piccadilly Lights is the world’s most complex, feature rich advertising display and surpasses all other out-of-home sites for its technical and interactive broadcast capabilities. Barnardo’s has helped transform the lives of millions of disadvantaged children in the UK, and continues to help families to build a better future. In 2016/17 more than 272,000 children, young people, parents and carers were supported by Barnardo’s through more than 1,000 services across the UK, such as young carers, care leavers, foster carers and adoptive parents, training and skills or parenting classes, as well as young victims of child sexual exploitation and those needing support with emotional health and wellbeing problems. This entry was posted on Wednesday, September 20th, 2017 at 14:23 @641 and is filed under DailyDOOH Update. You can follow any responses to this entry through the RSS 2.0 feed. You can leave a response, or trackback from your own site.